- impact creation, by linking the project to other initiatives and addressing the policy perspective. 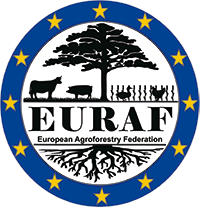 AFINET (Agroforestry Innovation Networks) is a thematic network aimed to foster the exchange and the knowledge transfer between scientists and practitioners in the agroforestry. AFINET acts at European level in order to take up research results into practice and to promote innovative ideas to face challenges and resolve problems of practitioners. AFINET partners include universities and/or organizations from nine european countries and one international organization. The project is coordinated from the University of Santiago de Compostela (Spain).